After making those delicious peanut butter cups, I had left over peanut butter. What to do with it? 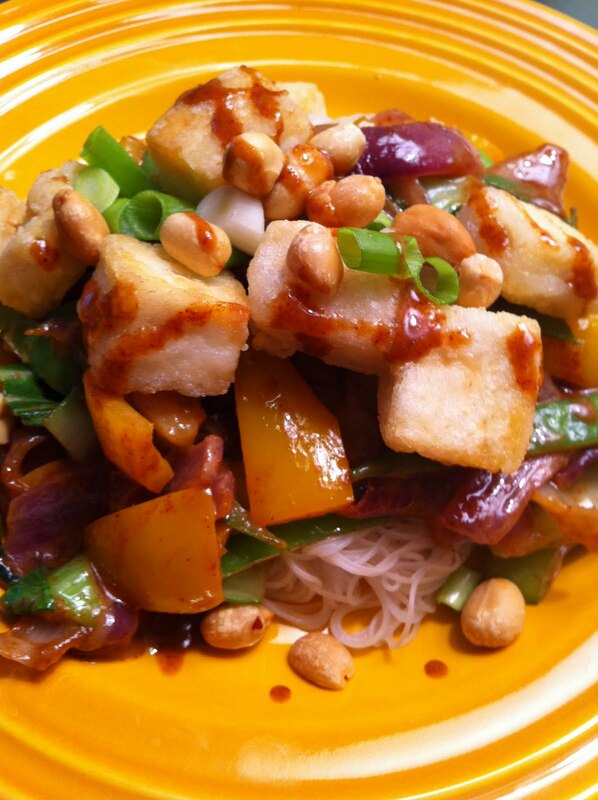 Crispy tofu and vegetables in an amazing peanut sauce! Homemade beats any restaurant anytime! Drain and press the tofu to get as much water out as possible. In the meantime, cut up all of the vegetables; slice the onions the long way, slice the pea pods in half the long way, cut the pepper in chunks, and cut up the bok choy as small as you like it. Cut up the scallions, both the white and green parts, and set aside. Put water up to boil for the bi-fun noodles. In a skillet, heat up some high heat oil, and stir fry the vegetables, starting with the onions. When they are translucent, add the peppers and pea pods. Dice up the tofu into squares by cutting the tofu in half the long way and then in half again and again. Pour some cornstarch in a bowl. Drop the cubes in and toss allowing them to get coated on all sides. In another skillet, heat up some high heat oil, and cook the tofu until crispy, turning them a few times to get all sides. When they are done, take out and drain on a paper towel. While this is going on make the peanut sauce by combining all the ingredients together and mixing well. When the water is boiling, add the bi-fun. It takes less than 2 minutes to cook through. Add the bok choy in at the last minute so it wilts. Drain the noodles. Mix the peanut sauce into the vegetable pan. To plate: lay a bunch of noodles on the plate, then pile the vegetables on top, then top with the tofu, some scallions, and peanuts. Using a spoon, drizzle the tofu with a little extra peanut oil. Then let it cool off. It is way better when it not screaming hot!